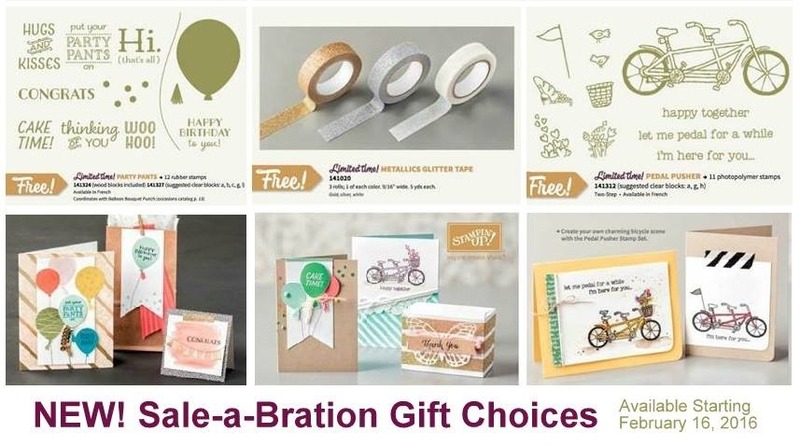 For the next few days, I’ll be featuring the Perfectly Artistic designer paper – one of the free with a $50 purchase options from the Sale-a-Bration catalog. See, I’ve been holding on to this paper since it came out, but something about knowing it was retiring in a few days (it is only available until Feb 15th), got me to actually start cutting into it and turns out it is super fun to use! what do you think? Funky fun or funky weird? When you have these scraps that are too small to stand on their own, but too big to just throw away, try creating off-kilter layers to help work with the differing sizes! I used a strip of Basic Black cardstock to ground everything and then just started stacking on my Perfectly Artistic paper. Once you have your basics down… keep up with the layering! 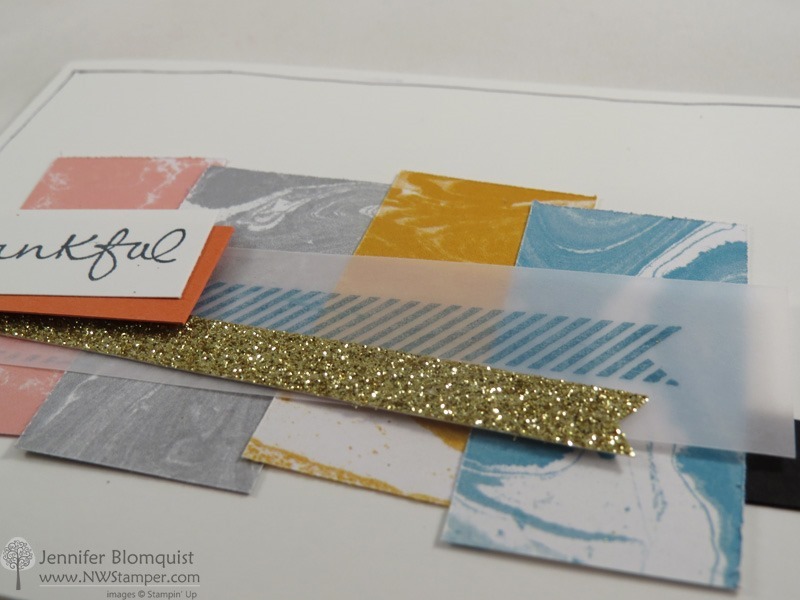 Vellum is a perfect way to break up a pattern on a paper without adding one more design into the mix. I decided to try adding a stamped image (from the Perfect Pennants stamp set) to give it something to pull it all together. But then, of course, I decided I needed some sparkle, so a scrap of Gold Glimmer paper was just what the doctor ordered! Have trouble making all your layers even? Don’t even try! Since everything else in this card was not straight, I didn’t have to bother trying to make my matting around my sentiment even either! 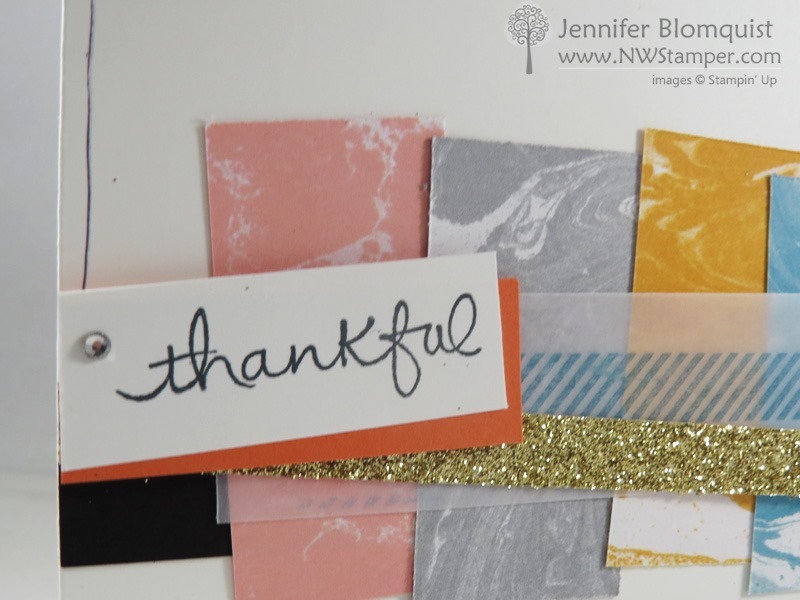 I actually use this trick a lot when I think I will have a hard time stamping letters (or images) straight… if you intentionally stamp or glue your papers at not quite straight lines, then when you stamp or glue something down that isn’t even… it looks perfect! It will match the rest of the card and look artistic, not like you messed anything up. Finally, I had to add one last touch, and that was to just hand draw a border line around the left, top, and right side of the card above my black cardstock. I love sketch lines and like the fact that it isn’t perfectly straight. Though it is easy enough to make them all nice and even with the help of a ruler. RETIRING ITEMS – Don’t forget that if you love one of these items, including the Perfectly Artistic paper, you only have a few days left to get yours. COMING SOON – these items will replace the above options starting Feb 16th. Still free with a $50 purchase, and I expect that glitter tape will run out before the end of Sale-a-bration. Just my prediction! Visit the Online Store to start shopping and earning your Sale-a-Bration gifts! Use Hostess Code TNCXV4MP at check out to get a special thank you from me! Pick a FREE item with every $50 you spend! See the Sale-a-Bration catalog.